Step 1 Get your oven to 350ºF. Tear off 4 sheets of parchment paper, making sure they’re all rectangular in size. Place a salmon filet on each piece of parchment, positioning it like the image/illustration to the left. Step 2 Cut off the green stalk of the leek, along with the root tip. Slice the leek lengthwise and continue to do so until the leek has been cut into thin ribbons (like the picture). Do the same to the green onions. 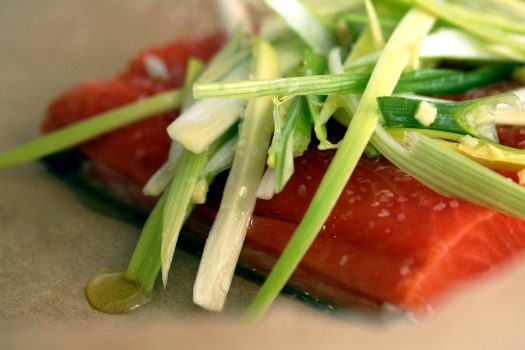 Toss the leek and green onion ribbons in a bowl along with the ginger, olive oil and salt. Mix with your hands to combine. Step 3 Drizzle a bit of olive oil on top of each salmon filet and sprinkle with a bit of salt. Top each filet with a handful of the onion mixture. Step 4 1. Referring the illustration above, at the bigger, horizontal dotted lines, join the ends of the parchment paper around the salmon filets. Step 5 Now, fold down the edges, either by crimping them (lazy way) or folding them over each other, like closing a coffee bag (fancy pants way), all the way down, until you’ve reached the top of the salmon. Step 6 Refer back to the illustration above, the vertical, thin dotted lines are where you’re going to fold and tuck in the sides of the parchment paper. Step 7 Place all the pouches on a baking sheet. Bake for about 15 minutes. My filets were quite thin, as you can see from the picture. I did mine at 17 minutes and they were a bit overdone. Be careful when you open the pouches since they’ll have a bit of steam in them. Okay, really you’re supposed to call this kind of recipe ‘en papillote’…but that just sounds so stuffy and intimidating. It’s just some kind of protein (usually fish), aromatics (onions, lemons, herbs, etc.) stuffed inside a piece of parchment paper that’s been formed into a pouch. This is an awesome way to cook any kind of fish, really. No mess to clean up and the steam created in the pouch keeps it nice and moist. We’ve got detailed, step-by-step pictures and even an illustration, so no excuses for not trying this out!